Marketing and Innovation have too long fallen to the wayside for professional services and law firms. At GroPro 20/20, Chief Marketing Officers and Business Development Leaders share strategies for engaging the most exciting clients and running a high profile organization. The traditional professional services industry is radically evolving. Changing client demands, employee expectations, rapid technology developments and other external factors will transform the nature of jobs and skills required in the future. 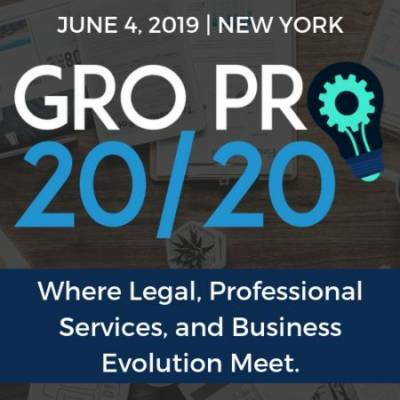 Gro Pro 20/20 is the only event that brings together Chief Marketing, Business Development, Sales, Strategy Officers and Executive Leadership spanning the professional services landscape for a highly interactive exchange of industry best practices and ideas. Offering participants the best of today’s thinking in law firm and professional services strategy and conveniently packaged into one day, Gro Pro 20/20 has established itself as the key community gathering for senior leadership representing global and national professional services firms.